Over the last sixteen years, Pilsen’s Working Bikes cooperative has redistributed more than 50,000 bikes across the world. A decade and a half ago, those bikes flowed from a two-car garage on Claremont Avenue; today they’re refurbished in a two-story warehouse on Western Avenue. If lined up end to end, those 50,000 bikes would make a continuous line from the shop on Western up to the avenue’s north end, down all the way south, and back to Working Bikes’s front door—nearly fifty-five miles of bikes. Working Bikes, in spite of its crammed-but-navigable shop, has a relatively straightforward mission statement: to save bikes from the scrap pile, to repair them, and to distribute them where they are most needed. These bikes come from all over the Midwest; from scrap yards, bike drives, and individual donations alike. The mountain bikes, whose tires and build are suited for rural roads and heavy loads, get shipped to partner organizations in Africa and South America, where local mechanics repair and distribute them. In 2014, 6,288 bikes were shipped to six organizations abroad. The Chicago-bound bikes are fewer (1,130 in 2014), in part because they must be repaired and given safety evaluations before distribution, a job that Working Bikes’ partner organizations handle internationally. Imagine an adult, back hunched, knees splayed, tottering down the shop aisles on a streamered children’s bike. Safety check concluded and laughter subsiding, the bikes are tagged and stacked in the storeroom to be driven to a local partner organization. Though most are distributed through community organizations, there are also bikes set aside for people who have the need for a bike but not the means. Individuals who qualify can walk in with a co-pay of twenty dollars and a referral from a social worker or case manager, and walk out with a refurbished bike, helmet, city-grade lock, and a year of free repairs. When the numbers show that Working Bikes donates one bike within Chicago for every six shipped overseas, it becomes easy to think of Working Bikes as an organization with a focus abroad. But Working Bikes has a community presence that isn’t quantifiable in quite the same way. As Working Bikes has grown over the years, its community initiatives have expanded alongside the growing bike movement on Chicago’s South Side. 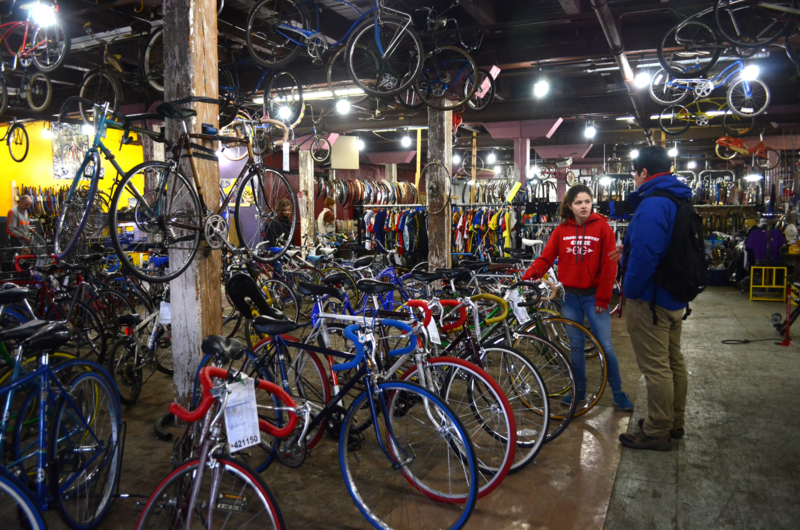 The Working Bikes shop is bikes from floor to ceiling—it contains around 1,500 of them between its two floors. Spruced up bikes are lined up for sale in front, while irreparably damaged frames and other unlikely sales hang from the rafters. The walls are lined with racks of spare parts and shop volunteers’ bikes. Where wall space goes unclaimed by metal, references abound: there are pictures of people riding bikes both fancy and funky; articles about bikes; posters with bikers’ maxims; shelves stuffed with bike maps, magazines, and calendars for local rides. There is rarely a moment of stillness here. Customers flow in and out the door, walking the rows of bikes with heads tilted, admiring the restored Schwinns and Raleighs. In back, behind the rows of colored bikes and boxes of handlebars, pedals, and horns, volunteers shuttle back and forth between the workspace and the racks of spare parts. They’re hard at work, but their concentration is light-hearted; clinks of nuts and bolts are interspersed with chatting and laughter. On the other side of the shop, volunteers sit crouched, sorting derailleur gears and brake mechanisms. Fifteen years ago, when founders Lee Ravenscroft and Amy Little operated out of their two-car garage, you wouldn’t have seen such activity. The two took weekly trips to the scrap yard, stacking the salvaged bikes in the bed of their pickup truck and fixing them up at home. Ravenscroft had been surprised by the high rate of bike abandonment in Chicago at the time. He wanted to send the salvaged bikes to countries in South America and Africa, where bikes are largely unaffordable, often costing more than a quarter year’s salary. As bike enthusiasts—Paul Fitzgerald, Working Bikes’ manager, among them—were drawn in to the operation, donations and shipments increased and Working Bikes made the move from the Claremont garage to a shop on Western. From there, it shifted south several times before settling in 2009 in the warehouse on 2434 S. Western, where they sell around two thousand used bikes, and service around a thousand more, annually. Along the way, Working Bikes has increased its local initiatives: the front service shop opened officially in 2011, and Working Bikes offered its first summer educational programs in 2013. The Annual Christmas Bike Sale, which sells children’s bikes for five to ten dollars apiece, sold ninety-five more bikes in 2014 than the year before. That growth has stemmed from, and demanded, changes that go beyond location. This year’s annual report provides bright visualization of the data for the distribution of bikes and other Working Bike statistics, giving literal and figurative color to what was last year a black-and-white PDF, and, before then, not available online. This past month, Akerman traveled to South America to visit several of the partner organizations on Working Bikes’ behalf. Working Bikes may be getting more organized, but they still don’t always pick up the phone. In recent years, the building itself has also undergone a renovation. Until the summer of 2013, the professional mechanics and volunteers shared a workspace on the second floor, which often led to overcrowding and frustration according to both volunteers and staff. The second floor is now the domain of the mechanics, the first floor that of the volunteers. Hanging on one wall of the new volunteer workspace is a sign: “Brandon’s Bike Shop,” spelled out in wrenches and various bike parts. Brandon Bernier was a dedicated Working Bikes volunteer who passed away several years ago. His parents, recognizing how much Brandon had cared about the shop, made a donation from his memorial fund to Working Bikes; Working Bikes decided to put the money toward a more unified volunteer space in his memory. 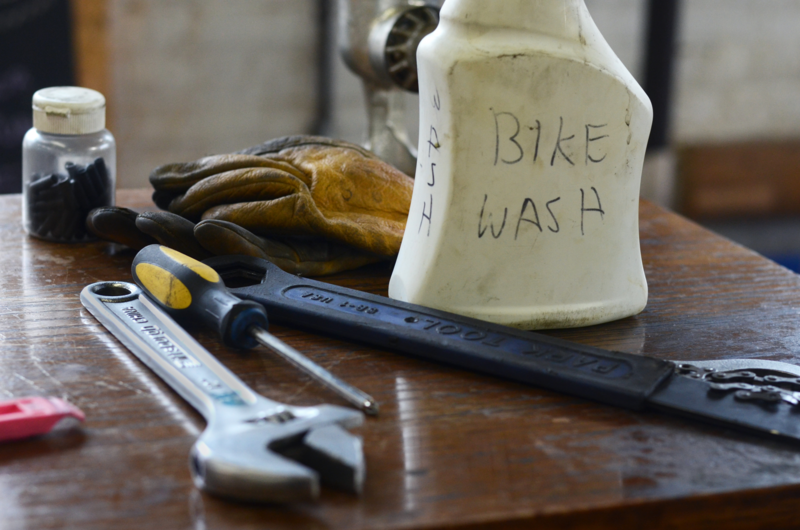 Brandon’s Bike Shop now serves as a center of work and learning, filled with grease-covered hands and half-dismantled bikes. On a Saturday afternoon, volunteer coordinator BK Elmore paced that workspace in a whirl of energy and sarcasm, offering guidance. When a volunteer was thrown off by the structure of the front hub, Elmore was there in an instant: “Did I hear you say you didn’t know what you were doing? Nope, don’t be so defeatist. I want you to say, ‘I’m ready to learn.’” Within minutes, Elmore had explained what had gone wrong, offered a solution, and was off to check on the progress of a bike on the other side of the shop. Despite the ever-increasing number of bike donations and active volunteers, Working Bikes remains an intimate space, one where names are remembered over numbers. When asked how many mechanics Working Bikes employed, Fitzgerald paused, listing their names and ticking them off on his fingers one by one before answering: two full-time, four part-time, and one who doubles as a driver. The ward that Working Bikes calls home, the 25th, is a cyclist’s haven. It boasts regular community rides, three Divvy stations, a half-mile of barrier-protected bike lanes and eight more of conventional lanes, three hundred bike racks, two bike corrals, and four bike shops. Alderman Danny Solis, whose rides are featured on posters on the shop walls, is a vocal advocate for bike- and pedestrian-friendliness. But the 25th Ward is an exception on the South Side, not the rule. In many wards farther south and west, there are areas to which bikeways and Divvy stations don’t extend. But in the last few years, the South Side has seen an increase in number and activity of bike advocacy groups, and in turn, in bike lane installations: forty-three percent of buffered lanes installed in 2014 were installed on the South Side, according to Chicago Department of Transportation (CDOT) data. CDOT’s 2020 Bike Plan calls for a bike network that comes within a half-mile of every Chicagoan residence, but 2020 is still a ways away. Ford, Bronzeville born and raised, recounted a childhood of adventures by bike and the surprise she felt upon returning to Bronzeville as an adult and finding its streets devoid of bikes. Years later, her son’s request for a bike inspired her to get one of her own, and several years later she ditched her car. And their parents? Older generations, said Ford, were raised to value the convenience that a car offered. The driver’s license symbolized the transition from child to adult; it rarely made sense for the bike to carry over into adulthood. Both Ford and Working Bikes have expressed interest in continuing the distribution annually in different neighborhoods. I asked Ford how sustainable she thought this relationship could be, given that the Bronzeville distribution nearly doubled Working Bikes’ local distribution from 681 bikes in 2013 to 1,130 last year. Working Bikes also works closely with several Chicago bike shops whose agendas of sustainability, education, and redistribution align with their own: Blackstone Bicycle Works, West Town Bikes, and the newly opened Bronzeville Bike Box, a shop run out of a shipping container on 51st and Calumet Avenue. Bill Depenbrock, a former Working Bikes volunteer now active with Bronzeville Bike Box, recognizes how close-knit the community of bike shops on the South Side is. “We share resources and mechanics; we go to each other’s rides and fundraisers.” In 2013, Working Bikes donated seventy-six bikes to Blackstone Bicycle Works and eighty to West Town Bikes. Most of the South Side cycling groups that have emerged in the last decade profess agendas of social change: equity in distribution of bike resources for black communities and between North and South Sides, community revitalization, health, and environmental action. Alongside Slow Roll in its social change endeavor are the South Side-based groups Red Bike & Green, whose Chicago chapter opened in 2011; the Major Taylor Cycling Club, which appeared in 2008; and Friends of the Major Taylor Trail, which dates back to 2003. The leaders of these groups recently wrote an open letter to the Mayoral Bicycle Advisory Committee, calling for a commitment to equitable distribution of bike resources and allotment of tax dollars to black communities on the South and West sides. Though Working Bikes does not take part in the more political efforts underlying the local bike movement, they serve as a valuable partner for those who do. 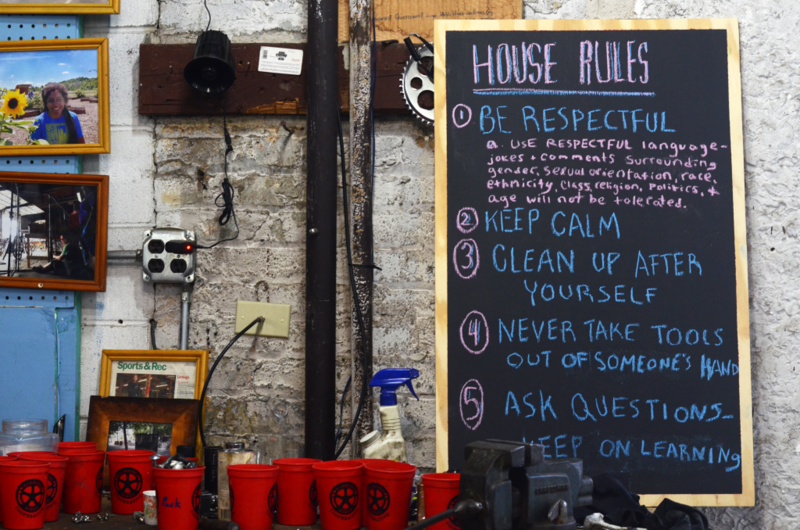 “Working Bikes is an important bike shop, more than anything because they are a community bike shop,” Reed said. “They’re family.” Reed has a three-part Slow Roll series planned for the month of May; the first will ride from Working Bikes, the second from Blackstone, the third from West Town Bikes. Working Bikes has found an awful lot of success through trial and error over the years, but it’s a matter of working with what you’ve got. There may not be one singular path—one perfect brake cable—towards bike equity in Chicago, but there are several that will work just fine. Correction March 4, 2015: An earlier version of this article misidentified the TAG Foundation as the Tony Alicia and Gwynn Foundation. There are many fine bikeshops doing social work – West Town Bikes on the west side, and Bikes N’ Roses in Albany Park.